The Sun and the Moon conjoined in Taurus for the New Moon. Mars and Uranus were in an exact square and about to change signs, Mars into Aquarius and Uranus into Taurus. Taurus is the sign of values, and Aquarius is concerned with cooperation. The arising change is emphasized by an enigmatic minor body (60558) 174P/Echeclus in conjunction with the New Moon. Echeclus belongs to a rare class of dual comet-asteroids. In astrology comets seem to be heralding a change, and our society needs one. Echeclus was discovered in March 2000 and initially classified as a Centaur. It is sporadically active and has undergone several outbursts since its discovery. In 2006 it was given a short-period comet designation. Also (2060) 95P/Chiron is cross-listed as both a comet and a Centaur. In the pre-discovery images of Echeclus from January 2000, a dust coma is evident. In December 2005 a large chunk of Echeclus broke off causing a massive outburst. A moderate outburst was seen in 2011. In the outer solar system, comets remain frozen and invisible. When the comet approaches the Sun, it warms. The coma and tail are formed and become illuminated by the sunlight. Echeclus came to its perihelion, the point in its orbit that is closest to the Sun, in 2015. A moderate outburst was seen again 2016. In December 2017 Echeclus underwent one of its brightest ever outbursts. 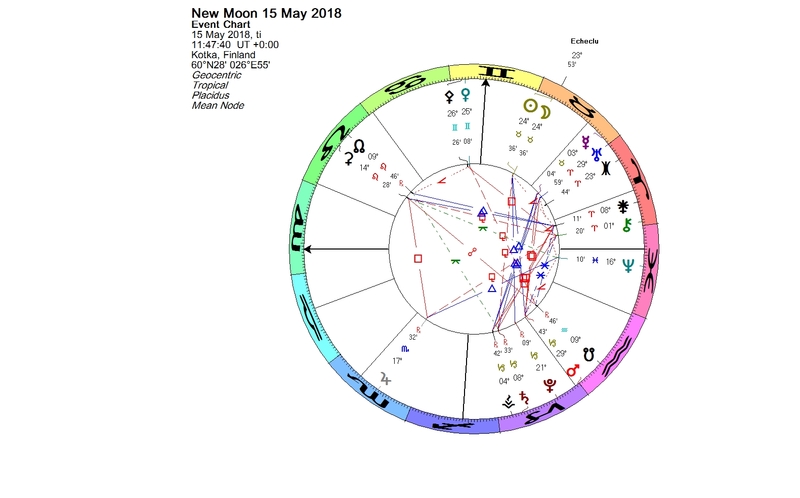 This entry was posted on Tuesday, May 15th, 2018 at 8:43 pm	and is filed under New Moon. You can follow any responses to this entry through the RSS 2.0 feed. You can leave a response, or trackback from your own site.